Make perfectly seasoned and delicious brown rice every time with this quick and easy recipe. Brown rice generally needs longer cooking times than white rice, but when using the MultiPot Pressure Cooker it is ready to enjoy in about 30 minutes. The distinctive flavor in this dish comes from the addition of seasoned rice vinegar. Seasoned rice vinegar is simply plain rice vinegar with the addition of sugar and salt. Along with the nutty flavor and aroma from sesame oil and toasted sesame seeds, this recipe is the ideal healthy side dish for your favorite Asian recipes. Brown rice is less refined than white rice and is unpolished, with only the husk of the grain removed. It is a whole grain and a good source of magnesium, phosphorus, selenium, thiamine, niacin, vitamin B6, and manganese. It is also high in fiber. Per Serving: 58 calories; 2g fat; 8.0g carbohydrates; 1g protein; 0mg cholesterol; 4mg sodium. I was a little skeptical of the 1:1 ratio of water to rice, but went ahead because I'd not done rice in a pressure cooker before. It works! AND the grains were evenly tender. The sesame flavors were nice for the dish I made to go with it (orange chicken), but even before those additions, I knew I had a new rice technique, at least when I'm not othewise using the pot to make dinner! 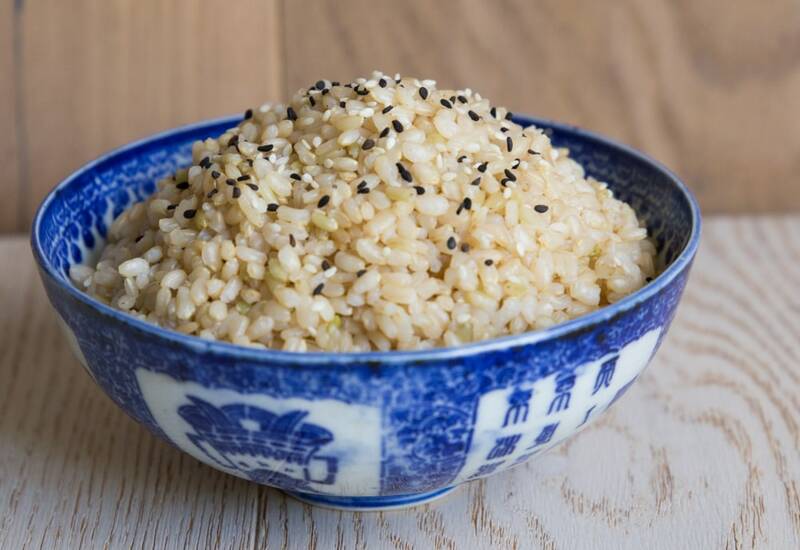 Solid brown rice recipe with some great kick from the vinegar and sesame oil. Done quickly in the pressure cooker, as opposed to forever it used to take with my fancy fuzzy rice cooker. This was a delicious brown rice recipe. Generally, brown rice is pretty bland, but this was nothing short of amazing. The toasted sesame seeds and oil was a great addition. This brown rice was very good! I made it to go with Asian-inspired shrimp and beef with vegetables. The rice vinegar and sesame oil gave it great flavor. It's so quick and easy with my pressure cooker too! Thank you so much for this! We tend to use brown rice and far too often the rice isn't quite done by the time we're eating, which is frustrating because brown rice takes so long! I made this last night and it was perfect and ready for dinner when I needed it. (comment on rice only, without the vinegar, seeds, and oil). While the flavor was good, I thought it was too al dente. I added a half cup of boiling water and heated in the microwave for 5 minutes while I cooked Sesame chicken. Both turned out well. So I’m guessing those that reviewed this recipe may not have followed thru with keeping lid on for 5-10 min after releasing the pressure - my rice was surprisingly perfect and tastes delicious!! I used exact measurements and no stick or hard rice!!! This pressure cooker is my new fav item in the kitchen!! !